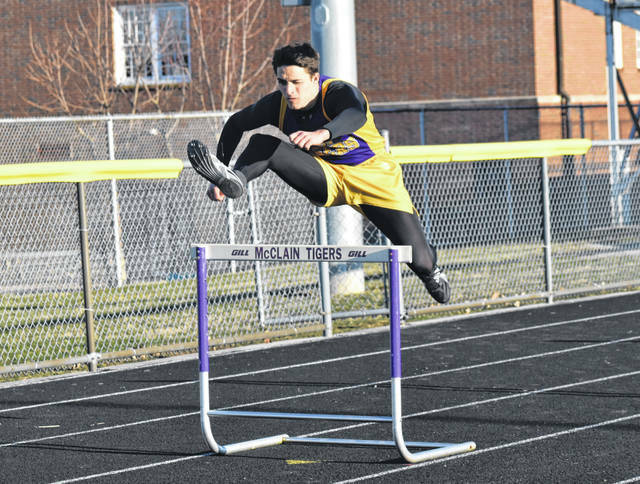 McClain’s Blake Gall clears a hurdle on Tuesday at McClain High School during the boys 300-meter hurdles during a dual meet with the Circleville Tigers. Tigers runner Chris Starkey approaches the home stretch in the boys 800-meter run at McClain High School on Tuesday. Lady Tiger runner Ashley Hardesty takes the baton in the girls 4x100-meter relay at McClain High School on Tuesday. The McClain Tigers and Lady Tigers hosted the Circleville Tigers and Lady Tigers for their first of four home meets during the 2019 season. The boys team from McClain was able to overcome Cicrleville in the team standing with the Tigers in purple winning the dual meet 88-47 while the Lady Tigers of McClain fell to Circleville 78-53. In girls action Maddy Crawford took first place in the girls high jump event with a height of 4’6”. Kerigan Pollard was first in the girls pole vault competition and cleared a height of 7’ 6”. Emma Stegbauer was first in the girls long jump event with a distance of 15’. Iva Easter was the first to cross the finish line in the girls 100-meter hurdles and finished with a time of 17.4 seconds. The McClain girls 4×100-meter relay team also took first place for the Lady Tigers in purple. Maddie Stapleton was second in the girls high jump with a height of 4’6”. Courtney Dodds took home second place in the girls discus throw with a distance of 69’3”. Crawford placed second in the girls long jump and cleared a distance of 14’7”. Zoe Rios finished second in the girls 100-meter hurdles event and just missed beating Easter by less than half a second with a time of 17.87 seconds. Kerigan Pollard took second place in the girls 100-meter dash and finished with a time of 13.27 seconds. Sarah Free was second in the girls 1600-meter run and finished her mile in 7:44. Arianna Cole placed second in the girls 300-meter hurdles with a time of 57 seconds. Easter also took second place in the girls 200-meter dash with a finishing time of 29.78. In boys action Cody Elliott earned first place in the boys shot put competition with a distance of 37’7’. Cam Closson was first in the boys discus throw with a distance of 89’. Chris Starkey took home the win in the boys high jump with a height cleared of 5’6”. Quentin Smith earned fist place in the boys pole vault competition with a height of 9’. Pat Fout won the boys 100-meter dash and finished with a time of 11.24 seconds. Blake Gall was the first place finisher in the boys 300-meter hurdles with a time of 49.1 seconds. The boys 4×800-meter and 4×400-meter relay teams each took first place against Circleville. Ethan Taylor took second place in the boys shot put competition with a distance of 33’6”. Kobe Penwell was second in the boys long jump and had a distance of 18’8”. Cody Elliott took second place in the boys discus throw with a distance of 85’. Alex Snyder finished two inches behind Starkey with a height of 5’4” and took second place in the boys high jump. Jacob Krethefer was four inches behind Smith in the pole vault with a height of 8’6” and finished in second place. Luke Bliss took home second place in the boys 100-meter hurdles and finished in a time of 20.4 seconds. Kobe Penwell was second in the boys 100-meter dash and finished with a time of 11.8 seconds. Reece Schluep finished second in the boys 1600-meter run with a time of 5:18. Starkey took second place in the boys 800-meter run and finished with a time of 2:18. Lyle White finished second in the boys 3200-meter run and had a time of 11:50. 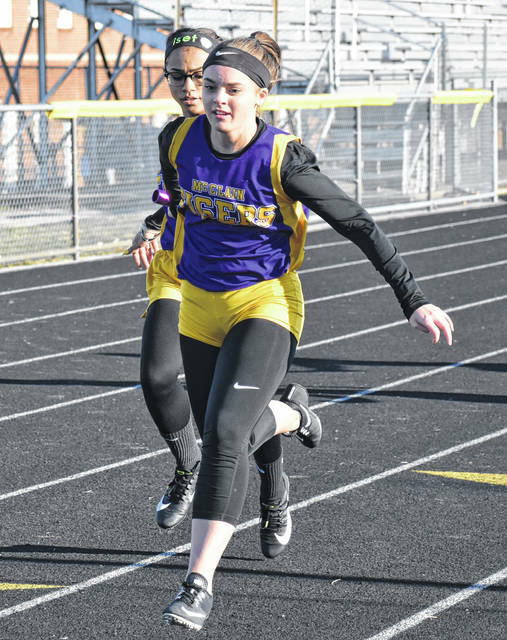 Lady Tiger runner Ashley Hardesty takes the baton in the girls 4×100-meter relay at McClain High School on Tuesday.